On July 2, 1968 Hawaii wrestling fans were treated to one of the biggest wrestling shows presented by Ed Francis. The card featured two World title matches and an outstanding under card. Over 8,700 fans showed up that night. RESULTS OF THE UNDERCARD WERE: Harry Fujiwara and Rocky Hunter drew. Curtis Iaukea defeated John Tolos, Magnificent MAURICE took the one fall win over Dino LANZA, Ray Stevens and Peter Maivia battled to a draw, and Billy White Wolf pinned John Bull in a one fall match. Billy White Wolf waits to attack John Bull. White Wolf back body drops a stunned John Bull. Dino Lanza confronts The Magnificent Maurice in the corner. Maurice charges after Dino Lanza with his cane. 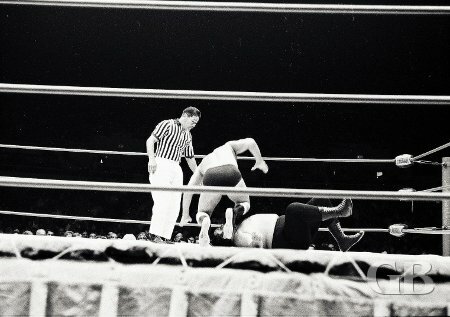 Peter Maivia drop kicks Ray Stevens into the ropes. John Tolos drops a knee onto a downed Curtis Iaukea. The match for the World tag team championship had PEDRO MORALES and PEPPER GOMEZ fly in from the west coast to defend their title against the team of RIPPER COLLINS and FREDDIE BLASSIE. In the tv interviews leading up to this match BLASSIE sent COLLINS a file to file his teeth to get ready for the match and COLLINS stated that he and BLASSIE "Would be biting on some tacos and frijoles," referring to MORALES & GOMEZ. During the entire match COLLINS and BLASSIE continued to bite on the foreheads of MORALES & GOMEZ resulting in COLLINS & BLASSIE being disqualified and fined $500 each for their actions in the ring. GOMEZ left the ring a bloody mess and required 7 stitches. World Tag Team Champions Pepper Gomez and Pedro Morales. 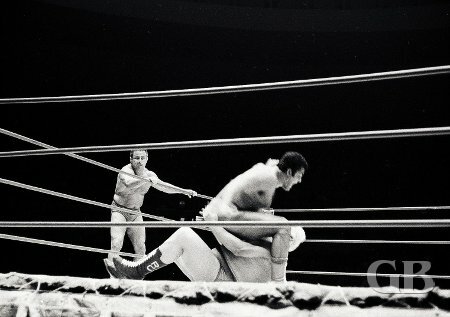 Pepper Gomez watches as his partner Pedro Morales bombs Ripper Collins. Ripper Collins and Fred Blassie work over Pepper Gomez in the corner. 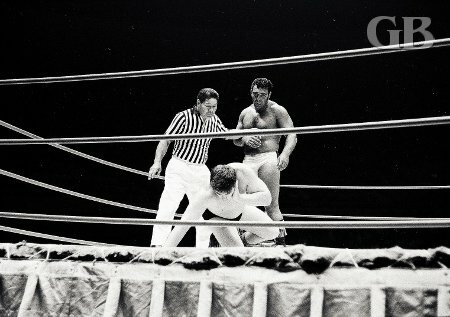 Ripper Collins bites Pepper Gomez as referee Pete Peterson tries to restore order. The main event featured GENE KINISKI defending his NWA World Title in Hawaii for the first time. 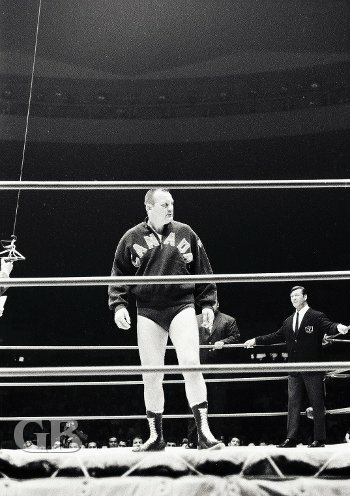 JIM HADY had won the right to wrestle KINISKI through a fan vote conducted by ED FRANCIS through out the month of June 1968. Wrestling fans were allowed to write in to vote for who they wanted to wrestle KINISKI and on KGMB's 50th STATE WRESTLING on Saturdays, operators were standing by taking phone calls from fans to vote for their wrestler of choice. In the end HADY beat out CURTIS IAUKEA who came in 2nd place. The World title match was 2 out of 3 falls with a one hour time limit. The match went the distance after both HADY and KINISKI split falls KINISKI attempted to finish HADY off with a Boston Crab hold. HADY kicked KINISKI forward and he fell and hit his head against the middle ring post which was not properly covered. KINISKI hit his head against bare metal resulting in a large cut to his forehead. For the remainder of the match HADY gave KINISKI the wrestling lesson of his life. HADY continued to use his fists on KINISKI's forehead, but KINISKI held on till the end of the hour and the match was a draw allowing KINISKI to retain his title. KINISKI was taken to Queen's Hospital and required 22 stitches to close the cut and was out of wrestling action for the next three weeks. World Champion Gene Kiniski looks over the crowd as promoter Ed Francis watches. 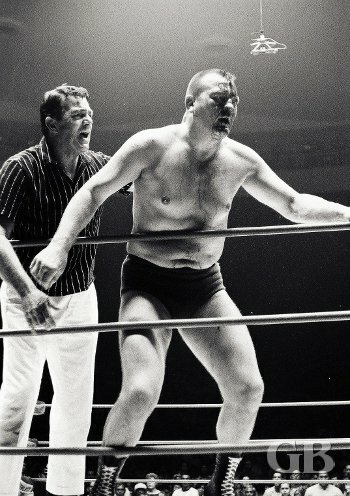 Kiniski applies an arm bar on crowd favorite Jim Hady. Gene Kiniski grabs Jim Hady by the legs in preparation for the Boston Crab submission hold. Jim Hady springs off the ropes with an elbow smash for Kiniski. Hady applies the sleeper hold on Gene Kiniski. 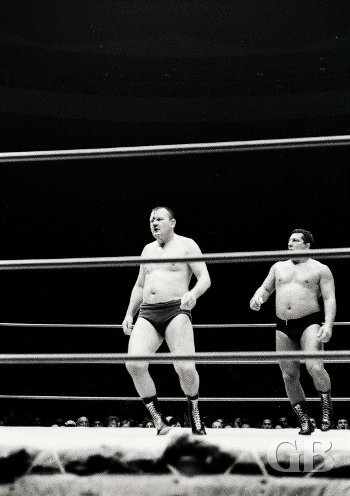 Jim Hady stalks Kiniski right after Gene suffered a gash on his forehead. Gene Kiniski, with his head split open, retains the World Championship.